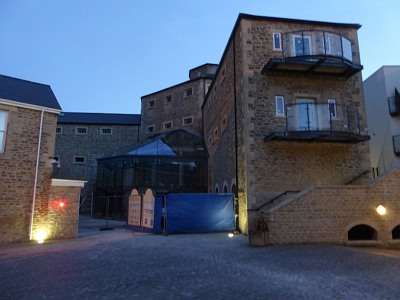 Back in 2007 The Old Gaol still had the swimming pool building attached. The opening of the White Horse Leisure Centre had led to the closure of the Old Gaol Leisure Centre. An attempt was made to turn it into an arts and leisure centre with library and possibly cinema, but there were not enough funds, and public opinion was against the library moving in any case. * be good value for money in terms of sale price, and if housing is included, it should have a mix of affordable housing. Cranbourne Homes won the bidding. They were judged to be best value for money, providing an estimates £6.3m to the public purses. Then the banking crisis hit in 2008 and according to an answer given by the Vale to Abingdon First under a Freedom of Information request, RBS withdrew its original funding agreement. The finishing touches are still being added. Balconies have been added to flats in the Old Gaol itself. 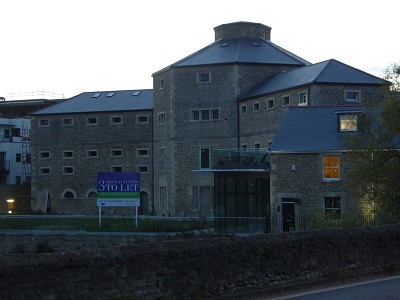 The original intention of the developers, in 2007, was to add a shop and 2 restaurants, but public opinion at that time was against a shop as there were empty shops elsewhere. And so the developers decided to go for 3 restaurants instead. Congratulations to Abingdon First for extracting that information from the Vale Council. 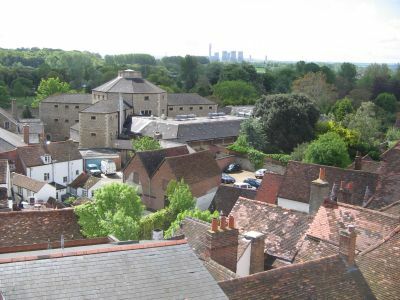 The original agreement specified arrangements for public access to the riverside and certain parts of the site – and that there should be some acknowledgement in the public areas (eg restaurant) of the history of the OG. We must make sure that happens. I don’t think that ANY of those original conditions have been met. * the new-build part of the development looks like Torrremolinos-on-Thames and how was permission obtained to chip holes in and hang tat-balconies off what must be a listed building? * the developer has wiggled its way out of the original affordable housing obligations. All reneged … this of, course, was not difficult given that The Vale Council don’t appear to have a clue about negotiating in a commercial situation. They are not fit for purpose. To add insult to injury Barber states that whatever funds are eventually obtained for the Gaol won’t necessarily be spent on Abingdon. 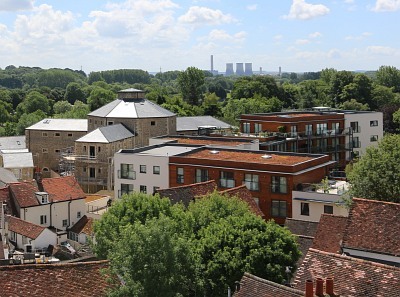 For The Vale, Abingdon is somewhere to be looted and to placate greedy developers by allowing them to build unwanted houses wherever they like … been enjoying your commute through the Town recently … ? flogged off behind closed doors, and now we know why. None of the commitments met, none of the reduced price money to go to Abingdon on Thames. Next up, Abbey House and Gardens. And yes the traffic chaos is still with us. May I suggest all those who like to rant about everything that is wrong actually do something like fight in an election to become a councillor rather than just type about it. Do local councillors have ‘power’ in/with VOWHDC to right the wrongs?. It would seem that the council may have under sold the family silver as out of 61 properties 41 of them sold for a gdp of 15 million (rightmove sold prices), working on an average of £365,000 a property that means about 22 million in sales for all 61. Should have got one of the many estate agents in town to have sold it, the market had recovered by the time these were sold in 2013/14 anyway so I would of thought the Vale would have re-re-negotiated back to a better figure. Has anyone heard any more about the Upper Reaches Hotel? I had heard that planning permission had been submitted for 50 flats but I might be wrong. It has all gone quiet about the hotel and the site. Colin; no, they don’t. Any quick scan of recent issues will show that public opinion and therfore councillor objection… is futile. This kinda answers Mary’s point #4 as well. …and…fair play to Abingdon First for doing an FOI request on this issue. If the FOI request came about by a councillor asking, I may have a little more respect for the position of councillors. As it happens….that respect and I guess kudos now goes, rightly so, to an anonymous person or people. They did what should have been done years ago. Daniel #8, Wouldn’t the councillors have known the deatils of the deal anyway? So what would have been the point of them putting in an FOI for something that they knew all along? Fair point Julian. I just think, if there’s a thirst for this information, and I think there is, then it should have come to the fore far earlier. The fact it is out, is great. The fact it took an FOI to get it…. ESPECIALLY if our councillors already knew…Looks pretty woeful if you’re a councillor accountable to your electotate. re: the access question. I think this may well be a case of use it or lose it. When the development is done, go every day to access the courtyard, ground floor and riverside gardens, and make sure others do the same. Complain to the council and Cranbourne Homes if that access is denied. etc. It is a bit like the ramblers protests when a footpath is blocked by a landowner. If you do not insist on your rights, the powers that be can claim that there is no desire for access to the river front. The gates are unlocked every day between 9 and 5, I believe. They’re always closed but you can just push them open to get from Bridge Street to East St Helen Street. Yes Rachel – a bit of pressure of the kind David suggests got those gates opened a year or two ago, but once the building work is finished we have to do the same for the route around the back of the building, and two routes to the riverside – all part of the deal – also to the ground floor of the main building. Hester, are there maps of the public access routes on the Old Gaol site readily available and, if so, where? Backstreeter, would it be possible to publish these maps/routes on this site? Were daily times of access specified in the original contract with the developer and, if so, what were those times? Out of curiosity, can anyone supply an educated guess as to how much profit Cranbourne homes will make on the deal? …. Probably enough to keep the Children’s Centres open (story on the previous page). I don’t necessarily blame Cranborne for this….but it shows how, if the councils were run properly; or just better, that we might not need such savage cuts. That’s what happens when you have boys doing men’s jobs ! The big men walk all over the little, toothless boys ! Someone from Cranbourne Homes actually lives in the Old Gaol complex. Now Abingdon First’s efforts have forced The Vale to come clean on the Old Goal deal the usual suspects are ‘coming all-over pious’ about the sad saga. As an account of self-reichtousness and post-hoc rationalization there’s the germs of a situation comedy-of-errors in this article. The standard of self-delusion on display has seldom been surpassed. nb. The wonderful photograph, accompanying the above article, of Sandy Lovatt, looking a tad cross in front of the poster adorning one of the windows at the Old Gaol would make a wonderful Christmas card. Newcomer – sorry, have been otherwise engaged for a few days and just seen your query about the access routes. I need to dig into my archives to find what you want – will either reply here or via Backstreeter. Thanks Hester. Two of us cut through the Old Gaol on Friday and it’s a conveniently quick route from East St Helens onto Bridge Street which I feel more would use were the details ’spelled out’ (as it’s not signposted) and publicized. Clearly routes 1-3 couldnt be made available while building work was in progress and, as I said above, it took some pressure to get Route 4 enforced, but it is now there, albeit not well advertised!. It will bei interesting to see what happens next re the others..
We took the route from the single gate facing, to the right frontage, of Twickenham House, through the arch and straight along to a single gate after which there were steps down and out to Bridge Street. Look at the success of The Cornerstone and Cineworld in Didcot. Just because we didn’t want the library moved for obvious reasons was no excuse. More Restaurants, why? We need other things to entertain us and educate us, not just more places to eat.